Ho`olei's three-bedroom, three-and-a-half-bath villas are 3,200 - 4,000 square feet of space to accommodate multi-generational families. Each villa offers a state-of-the-art kitchen with stone floors, vaulted ceilings, spacious living areas and luxurious furnishings. The master bath has a deep soaking tub and separate glass enclosed shower, while other bedrooms have their own full baths. Each villa also has a private elevator, laundry room and attached garage. Six restaurants offer a variety of dining choices. Choose from Hawaiian cuisine of fresh seafood, coupled with locally grown fruits and vegetables, to pasta and pizza and everything in between. 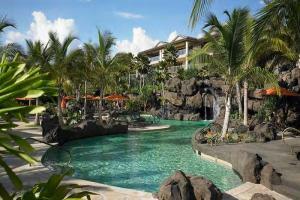 The resort also features lounges in Bistro Molokini, Botero Bar, Grotto Bar, and the Volcano Bar. Humuhumunukunukuapua'a and Botero Bar offer live music daily.